An interview with Yuka Sato, two-time Japanese Champion, World Junior Champion, two-time Olympian, and 1994 World Champion. Also known as a choreographer and coach to Alyssa Czisny and Jeremy Abbott. We talk about her having Olympians as parents and coaches, her training philosophy, and how she got lost on a bus in Canada while still not knowing much english. 53 minutes, 38 seconds. Win a photo of Yuka Sato! 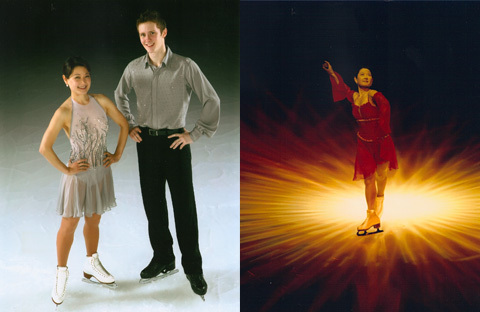 There is a contest running with this podcast: win either a photo of Yuka Sato by herself, or with student Jeremy Abbott. The photos are NOT signed. To enter, send me either through email or my Facebook page the answer to the following question: Who became Yuka’s coach when she moved to Canada? All entries received between March 7 to March 31, 2011 are eligible. The winner will be picked at random from all correct entries sent. Click here to learn more about how to enter. On her most embarrassing skating moment: Do you really want to hear it? [laughs] I was skating with Jason [Dungjen, her husband] in Germany, and we were doing a pairs spin, and when you change the position, my costume was stuck in Jason’s hand or arm, but I had to change position, to get out of that first position. And part of my body came out [laughs], and when I came out of the spin, Jason looked at me and said, ohhh! You’ve got to fix yourself! [laughs] It was really embarrassing. Or so I thought. On starting in skating: Quite honestly, I don’t remember the first time I stepped onto the ice, but I loved to skate since I was a child. And here I am, and I have no doubts whatsoever to not want to skate. Later on, around teenage years, I had a little frustration and difficulty around my career, just going through some stuff like everybody else. But skating always has been part of my life, and I can’t really think of myself without skating. On figures: My figures were very decent. I did do my first worlds, in Halifax, that was the last year that they had figures, so obviously I had to be ready for worlds level. The competition itself wasn’t as successful for me, I just had a little issue with the schedule, and I had to rush myself to get on the ice. But with that situation, I didn’t do my best. I think I was 16th, I don’t remember exactly. On her triple loop jump: I always had a good feel for the loop jump. My father is a very good teacher to teach children the basic stuff, all jumps and everything, but my mother is also quite good with technique, and with this particular jump my mother helped me a lot. On training in Ottawa with coach Peter Dunfield: This was around the time when — family business is not always easy. It’s wonderful at the same time, but for a teenage girl to have to listen to the parents, and the parents getting really frustrated with their daughter [laughs], they said, you know what? You have to go somewhere else and learn what it means to receive lessons, and to treat that as an important lesson, and not to feel like you’re being told by your parents what to do. You need to go elsewhere and learn to take lessons from others. The first year I was very excited to go to places outside of Japan, and North America was to me always a dream place. Sort of like, I guess, if you look at Disneyland, for me it was like a very Americanized place. And Canada is in North America, so to me it was sort of like, okay, I’m gonna go to North America and practice. It was sort of wow, a fantasy, a dreamy fantasy that I was always chasing after. So I thought at the time [laughs]. [The coach] was my father’s choice. He has been around in the world, taking his own students to international competitions. He always has respected Mr. Dunfield’s work, and as a person. There were a lot of choices available to him at that time. I believe it was right after the Calgary Olympics and Elizabeth Manley had just taken the silver medal, so Mr. Dunfield’s existence came to my father’s attention. And he always has struck him as a person backstage, behind the scenes, as a caring person and how he treats his students, my father always has remembered. And he was, if I have to send my daughter into somebody’s hands, miles and miles away from home, who would I trust? Who would I like? On speaking English while training in Canada: I actually couldn’t speak one word of English when I arrived. In Japan in the school we all have to take English as a second language. We all learned how to read, but the pronunciation is difficult and also the hearing is difficult. So I spent the whole entire summer the first year I went to Canada, it was difficult because I couldn’t understand what people were trying to say. At the end of the summer I was just starting to catch some words, and really, even though I didn’t understand what they meant, I was beginning to be able to put some words together and to understand what they were trying to say. So that was the start of it. It really wasn’t easy, And later I started to understand better, and I thought back to my babysitter who was raised in North America, New York and Vancouver, so she had a really good accent, and she taught me just the casual conversations when I was three, four, five. The skating language is still universal, and that was probably the easiest time and the most comfortable place to be. But once I got off the ice, that was when the fun began [laughs]. Taking buses to places, treatments, massage, all those things. And I didn’t know the custom to transportation, how to get off, because they don’t really say where the next stop is. Where I’m from, the middle of Tokyo, everything is very efficient and convenient — the subway, ground transportation, anyone could get around. And when I was in Ottawa, which is a beautiful place, it’s not as developed in that type of transportation. To get around it was very difficult for me. And this was a really scary serious experience I had, I missed the bus stop, and I went on, and on, and on. And I basically ended at the depot. I was on the bus at the back of the bus, and the driver didn’t see me. And he said, what are you doing here? And I said, I need to get off at such-and-such bus stop. And he goes, wow, that’s an hour away. And I started crying because I didn’t know how to do this, on my own, 16 years old. But this man was very sweet, so he wrote down on the paper, this is the bus you have to take, and you have to change at this place, and the number of the bus and everything. So in the evening I finally arrived at the home of the family I was staying with. That’s when I really had to learn quick, to become independent. That was when I really needed to grow up. On winning the 1990 World Junior Championships in Colorado Springs: It was fun. All I remember then was that I had a good time with the team. I skated a really good short, but I don’t remember much else, other than how difficult it was to breathe. That was my first time with the altitude, and boy, I was just sucking wind so hard, and I just wished this could be over now [laughs]. On competing against Midori Ito: It wasn’t difficult to compete against her at all. She was an idol, yes. For me she was like an unreachable persona, and the jumper that she was — I never thought of it as competing against her, I was in the event with her. I always admired her, and I always knew it was impossible for me to jump as high as she did [laughs]. On the 1992 Olympics: Prior to that, the previous season, was the most bitter experience that I’ve had. That was the year that I had to make a change in career and take a serious ownership. It was a turning point of my career, and if it wasn’t for that season with that feeling of failure and everything else that came along with it, I wouldn’t be here today. Working really hard throughout that whole season and making the Olympic team – the Olympics was wonderful when I got there, but it was more the journey of getting there and what it taught me. So many lessons that season. On the 1994 Olympics: I had a major mistake in the short program. I did a very decent long program, but it just wasn’t good enough. I was in the stands at the awards ceremony watching the three girls on the podium, and I said, next month I will be there [laughs]. That one mistake in the short program would have totally changed the whole thing. It was devastating to me because you work so hard to skate well at those special moments like the Olympics. And there I was doing my single lutz in the combination [laughs]. And I can still see it in slow motion, like what just happened. More than how well I skated in the long program, I can still remember that lutz. I skated in the long program right after Josee [Chouinard], so Josee was off the ice and Tonya [Harding] was skating, and something had happened and the music stopped. And neither one of us knew what was going on, but Josee had to skate after Tonya, and there was confusion, chaos, sort of rushing through, so she had to get herself together quickly. And she got out there, and because I had to skate after her, I started getting ready, but my father and Mr. Dunfield were very calm and said — when the incident happened, Tonya went to the referee and was having all this talk about what to do and so on, so in the end the total time would have been the same, however many minutes that took for Tonya and then to move on to Josee. By the time it got to my turn it would have been exactly the same time as I would normally skate. So nothing was going to change and I just had to stay calm and regroup for the long program. On the 1994 world championships: As I arrived to the arena I knew that this competition was going to be different and special for me. It was different on top of having to skate to a home crowd. But at the same time I was so prepared and definitely ready to compete, in that competition mode, let’s get going [laughs]. So it was all exciting, but I do remember after my freeskate performance, just looking at the crowd, and everybody was standing and chanting. It was just so special, and I’m so lucky to have won my Worlds title at the home crowd. On Surya Bonaly’s behavior on the podium at that Worlds: It’s so funny that everybody is like, wow, it’s so unfortunate, I’m really sorry that it happened. But, you know, it was so funny, that whole week that I was there, I was in such a peaceful place, and nothing really distracted me except for what I was doing, and other people’s actions, none of that really bothered me. And that carried through even through the podium incident. I just looked at her and I felt sorry for her, not to be able to accept — you know, there are a lot of times after my performance or after the results, oh, I wish that I could do this better, or I should have won. There are a lot of times and experiences there. But you go home and you sort of figure out what you did wrong, and you move on from it. And that was the very first experience that I was involved in, that somebody couldn’t accept it. I felt a little sad for her and sorry for her. And aside from that I was just fine. On her great edges: I think I’m really fortunate that my parents taught me the basics so well. And that’s something that happens when you’re at the young age. But I carried it through, and of course I love to skate and I had my specific — not goal, but ideal of the style of skating that I wanted to be. So I constantly worked on it. I worked on the basic skating skills over and over every single day. And today I’m really thankful that because even 16, 17 years after I turned pro, I’m still able to skate without too many injuries. And it’s taught me, going back to all those years training as a competitor, and now that I teach the smaller kids, to teach them good technique when they’re young, when they’re ready to compete aggressively, that they’re ready to go. And I really firmly believe that, how important it is. On skating in Stars on Ice: I had a family friend who lives in Sacramento, and they always taped any skating events from the United States and sent it to us. And I would watch those tapes, and every year there was Stars on Ice on those tapes. Scott Hamilton, Rosalyn Sumners, Barbara Underhill and Paul Martini. And I just was fascinated by this whole entertainment and the quality of skating. And I looked at my parents and said, guys, I want to be in there [laughs], this is where I want to be in the future. And my parents said, Yuka, we appreciate that it’s a wonderful show, but you have to be a world champion or Olympic champion to be part of that show. So I said, all right! I will become one! [laughs] Stars on Ice and becoming a pairs skater were my two biggest dreams as a child. The dream is still there, and boy, it’s such an intoxicating experience for me, and feeling home at the same time. I always worked really hard to be a Stars on Ice cast member, and once I got there I didn’t want to leave [laughs], it’s so much fun, the skating part, and touring, and skating in different cities every night for those months of the season. And not only that, but you become so close with your cast members. That’s where I just became so addicted. They’re an extended family of mine, and you become so close and so attached. And today I have so many great friends because of that. On her music choices as a professional: That’s an interesting question because I never thought about it. I always had some artistic idea in my mind somewhere, but when I was competing, I didn’t have too many choices anyway, and I didn’t have enough knowledge to package myself. I had the idea of what I wanted to be like, but I didn’t have enough connection to people who could give me that. And it was in those early days when the professional opportunities for skating were non-existent. I didn’t do too many shows, I didn’t have access to too many things. So we just did one of those traditional skating styles, ta-da was really what it was [laughs]. But that’s where I learned how to present, ta-da, which you really do need in skating. So after I turned pro, just like my parents said once, you want to enter that world, you need to have titles. And they were right. Winning the world championships opened a lot of doors for me, and I ended up being able to work with so many wonderful people — choreographers, directors, you just meet so many people and work with so many people, and that teaches you so much. And today what you’re seeing, I’ve developed myself as a professional skater, and I’ve pushed the envelope too. And again that was a very thankful experience, the education I received by working with all these choreographers and mentors. You can’t always get stuck in the same style, you can’t just always do something you want to do just because you like it. And skating with Kurt Browning, Scott Hamilton — Kristi Yamaguchi is another person, watching her develop as a skater and developing new avenues. She may not be at the time so comfortable with it, but she’ll do it anyway, and she’s so broad, she’s got all these things in her sleeves [laughs]. She’s a wonderful performer, and I admired her so much and looked up to her, and I said to myself, this is what I have to do, I really need to challenge and do things that I may not be comfortable with. And I went to the person who could put something like that together very well, and they would teach me, and I would go, oh, I see. And all those years and now you see the skater that I am. On doing pairs with her husband: Romance came first. We were dating and we were engaged, and then we got married and started skating together [laughs]. Jason and his former partner, who he shared two Olympics with, they ended their partnership and Jason was free. He didn’t know what to do at the time, he didn’t know if he was going to look for another partner to compete with or if he was going to move on and not skate. And that’s when I said, hey, I don’t know how to skate [pairs], why don’t you teach it to me. Because I didn’t know, I wasn’t certain I could be a successful pairs skater, because at the time I was 24 and you don’t learn successful pairs skating at 24. It’s just not right, it’s not normal [laughs]. Pairs skating has a fear factor and it’s probably better off that you learn these things younger. But I didn’t know, I just casually asked him, hey, can we go to the rink, and you can teach me some things. And the minute we started skating together, I sort of felt like, this could work. I felt pretty good and Jason felt the same thing. So we started to continue. But now Jason has decided to move on. He said when he turned 40, I’ve been lifting people over my head for 30 years, and I just don’t want to wake up with these backaches any more. He just was done, and I had to respect that. On coaching Alissa Czisny and Jeremy Abbott: You know, I believe — of course I have heard that everybody is talking about both Alissa and Jeremy, people say they are weak mentally. And I look at them and I work with them, and I don’t believe so. They both have a great concentration when they need to, and I also think that they are actually very strong. And they have great judgment over things in what they do and in their choice. They’re amazing. But I felt that they’re not confident, they lack confidence. I think over time that they are told they are weak, and they started to believe it. So we started working together, and one thing is that I really try to make things, even in the way of how I talk to them, I try to make things positive. Not just to say something they want to hear, you can’t do that. Even in the long months, a whole season of a working relationship, there are times when you have to be very tough and be the bad guy or the mean guy, with tough love. But you can do it in a way that’s positive, and I try to make a conscious decision to make it positive and to talk to them in that way. I believe that you have to have passion in whatever you do, and if you don’t have passion you’re not going to do well. And that’s not something that you can teach. If you have passion in skating or if you don’t, that’s who you are and what you come with. Both Alissa and Jeremy have passion in skating. They value their career as something that’s very important to them. And as long as you have that, then you can work with it. So they have it. And I always try to remind them of that: why are you here? Why are you skating? Because you do sometimes become ridiculous when you are hard on yourself and you try to be perfect all the time, which they both are, very perfectionist. But I always have to tell them that perfections don’t exist, it’s never going to be there so you have to forget about it [laughs]. And it’s OK to not be perfect, but what you do with the mistakes and how you embrace it, is the key. Again, that’s trying to make it in a positive direction. Whatever you do with it, that’s OK, you don’t have to skate great all the time because that’s just not going to happen. But how you deal with it is important. You have to really take a look at yourself and figure out where your value is. For skating, for me, I love to skate. This is something very very important to me that I cherish, so I take pride in what I do. And sometimes it comes with a failure or unhappy moments. But because you cherish this career so much and you take pride in it, it’s important to come out of it with something that makes you happy. On how she stands calmly at the boards while coaching: I guess that’s who I am. I’m not always calm, though. Inside I’m jumping up and down, and my heart’s pumping like crazy. If you put a microphone on my chest you’ll probably hear it, I’m so nervous when my skaters are skating [laughs]. On coaching next to her father at the boards: It’s not odd at all. I’m really happy to be sharing the boards with my parents, it’s a relief. And my father is so cool. Even if his student is not in the practice with my student, he’ll stay and watch. Not that he tells me what to do and what not to do, but if I ask, he’ll always tell me the honest answer. He’s just there for me and I love it [laughs]. On being a stunt performer in the movie Blades of Glory: It was fun. It was actually a quick filming. From Stars on Ice we had three teams, Jason and myself, Jamie [Sale] and David [Pelletier], Kyoko [Ina] and John [Zimmerman]. Six of us went, we were in the middle of the tour and we drove to the location, I believe it was in Valencia, California, and we shot for three hours and that was it. We just each went out there and did what we were asked to do, our tricks or whatever. No Will Ferrell. I would have loved to meet him because he’s so funny. On the current strength of Japanese figure skating: I’m not surprised, but I am proud. I am proud of our Japanese skaters [laughs]. I am so happy to see it because even in the time I was skating, skating was not the most popular thing in Japan, and we didn’t have a lot of resources. So it was not easy for the Japanese skaters, or Asian skaters, I should say, to get enough resources and to stay. But today, it’s taken off and everybody looks really polished and so good. So I’m just really really proud. And what I’m trying to work on now, because of all the experiences I’ve had as a professional skater, and all the things I’ve learned, and understanding that the skating has become so popular and everybody’s so interested, I would really like to bring back something that I’ve learned over the last 16 years as a professional skater, and to just sort of give back to the sport and to develop or be part of developing Japanese figure skating even more. I’d like to produce some shows and things. That’s my next dream. I’m a greedy person [laughs]. Thinking back, the last Olympic games in Vancouver, this was actually the first international competition in which my father appeared, and he was one of the very first people from Japan competing. And 50 years later, he was standing at the boards in Vancouver with his daughter. And he said, those 50 years, he started pretty much unknown, he didn’t know anything about what others were doing so he had to learn. And the trip wasn’t easy back then either, to get to North America or Europe, anywhere, it took about two or three days to get anywhere to compete. And now, the Asian skaters are doing so successfully, and have the resources — it’s such an evolution and this is why I feel it’s important for me to give back to Asia to produce something or to bring back something I’ve learned over the past 16 years. definitely the best ever! so graceful! beautiful lines, jumps and great choice of traditional/classical Japanese music. What a visual delight she was to watch.